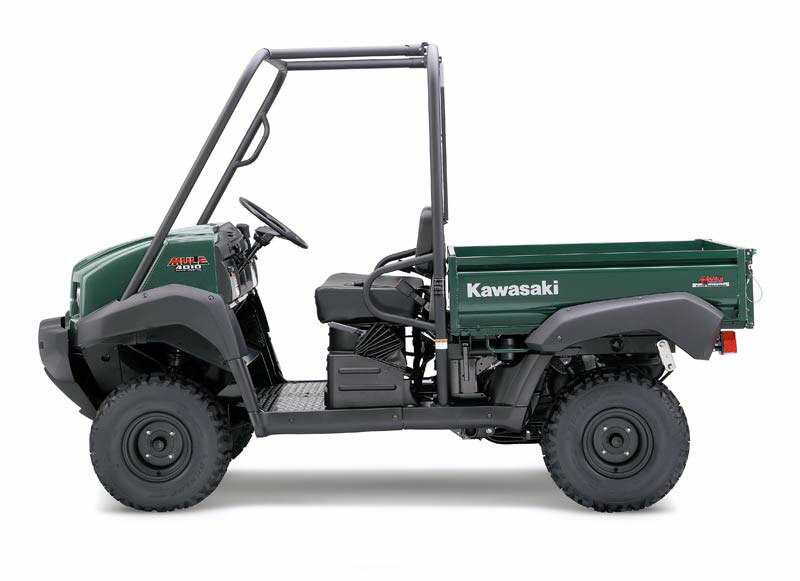 When four-wheel-drive traction is a must for hauling cargo around farms, through fields or to remote job sites, the Kawasaki Mule™ 4010 4×4 is the off-road utility vehicle of choice. 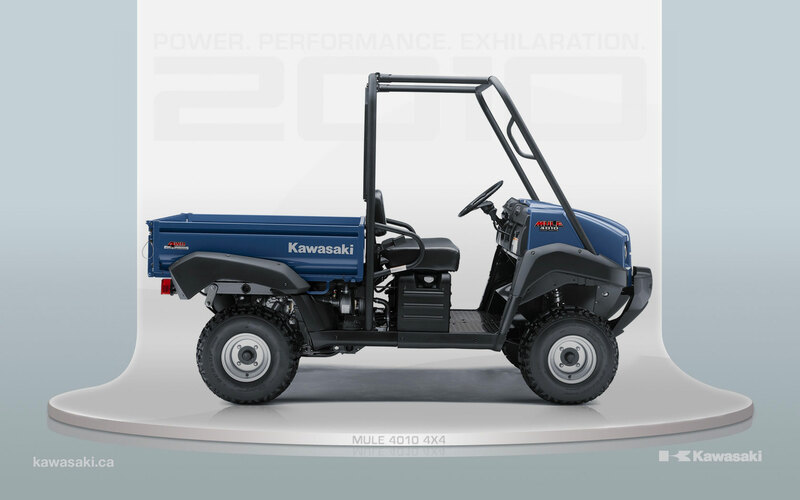 With its full-size chassis, selectable four-wheel drive and powerful, digital fuel injection (DFI®) equipped engine there is never a doubt it can get the job done. 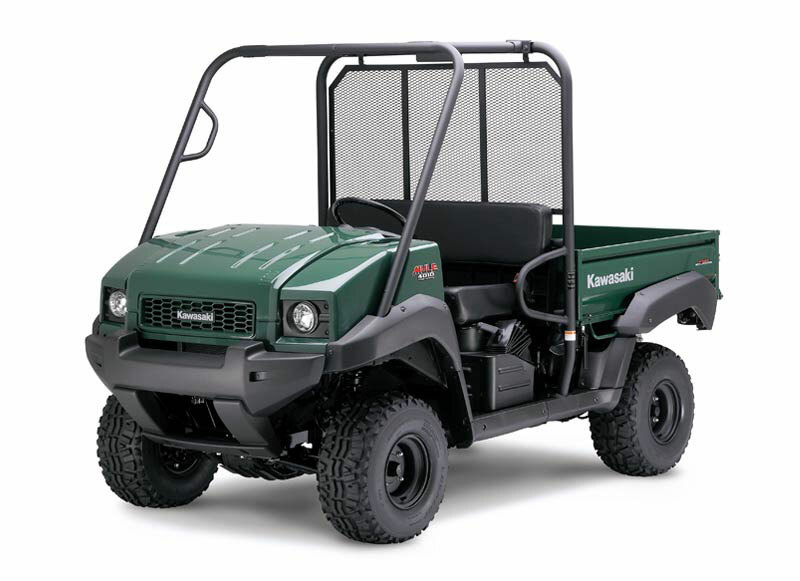 The Mule 4010 4×4 also features an electric power steering (EPS) system, a fully-automatic transmission, locking rear differential and a tilting cargo bed. Proven 617cc, 4-stroke, 90º V-twin, OHV, liquid-cooled gasoline engine now features dual injector fuel injection. The switch to fuel injection means stable power all the time, smooth response, improved power feeling, easy starting and no need to adjust engine settings to suit climate and varying altitude conditions. To ensure smooth engine response, the engine features dual throttle valves. The throttle body contains a Ã¸34 mm upstream (sub-) throttle valve and a Ã¸30 mm downstream(main) throttle valve. The sub-throttle valve is operated by the driver via the accelerator pedal; the main valve is operated by a step-motor actuator which is controlled by the ECU. The ECU uses throttle position input from the sub-valve to determine the ideal throttle position for the main valve, ensuring smooth inlet airflow. To keep the fuel injection system simple and reliable, rather than use an atmospheric pressure sensor, the ECU calculates atmospheric pressure using the pulse air pressure measured by the inlet pressure sensor. The ECU compensates for air and engine temperature and atmospheric pressure, ensuring sure and prompt engine starts in a variety of conditions (including cold, high altitude, etc). Auto fast idle when the engine is cold means being able to move out right after a coldengine start. The ECU also enforces the vehicle’s maximum speed. In Hi-gear, the throttle is slowly closed as max vehicle speed is approached. In Low-gear, the throttle is closed partially before fuel is cut at the engine speed where the max vehicle speed would be exceeded. Kawasaki Diagnostic System (KDS) can be used to diagnose the fuel injection system. Compact and lightweight, durable and powerful, the engine is mounted in a rubber-isolated sub-frame to ensure low vibration levels. Overhead valves designed for efficient running and good fuel economy are durable and operate quietly. Crankcase breathers fitted to route blow-by back to the intake pipe for cleaner exhaust emissions. Belt-driven automatic transmission with a Hi-Lo dual-range transfer case and selectable 4WD with manually operated differential lock for high versatility. CVT air cleaner with easily replaceable filter element reduces CVT wear by cooling it with filtered air taken in through the overhead frame (as per the engine intake). All the MULE 4000 Series models are adorned with a new, no-nonsense big-truck styling package. The serious work image is emphasized by the squared-off, wide design, oversize bumpers and fenders, and a greater wheel-fender clearance. Steel diamond-plate flooring and steel cargo beds contribute to the tough image. Seethe current applicable Kawasaki accessory catalog or www.kawasaki.cafor all of the latest Authentic Kawasaki Accessories available for this model. Cargo bed dimensions (LxWxH) 46.3 x 51.6 x 11.3 /15.6 cu. Ft. Cargo Bed Capacity 800 lbs. Fuel Tank Capacity 23.5 L.